If you do any shopping at Amazon.com, then there’s a quick and easy way for you to help out Christ the Redeemer. It is through a program that Amazon has called “Amazon Smile”. 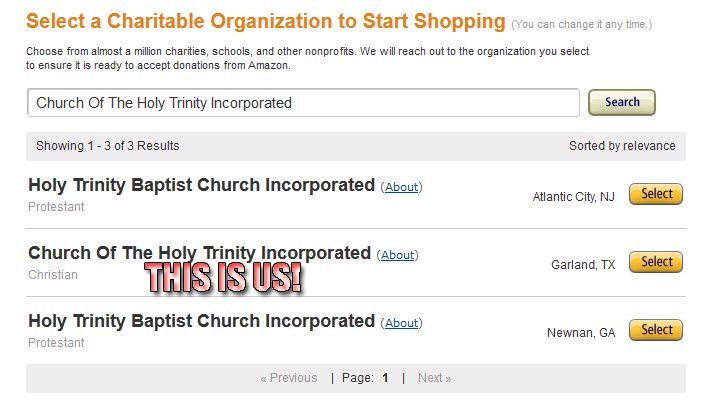 This is a program that will benefit CTR, as a small portion of your purchases will come to us. From there, the experience is exactly the same as it normally is. It does require you to use a web browser. Mobile apps (such as iPhone, etc) won’t work with this. Once you’ve done that, you will need to pick “Church Of The Holy Trinity Incorporated” in Garland, TX as shown below. From there, you click the select button next to our church name, and that is it – you’re done! The top part of your browser will look similar to the following screenshot once you’ve made this selection. All you need to do from this point is to go to http://smile.amazon.com when you go shopping and a percentage of the cost of your item will come to us. If you’d like to read more about the Amazon Smile program, there are some links on their site below for you to read.